Olivia was rescued from a house in a small town in Playa del Carmen. She was tied to a tree with no comforts, including basic necessities such as water and food. Her owners tried to do what they could for her, but with little education and lack of money this proved difficult. Olivia was found with 5 puppies, approximately 3 weeks old who were being kept in a cardboard box with no shelter or food and water and were not near their mum (she could not even get close to them). All the puppies and Olivia (she actually knows her name as Vicky), were taken to have check ups and necessary treatment. 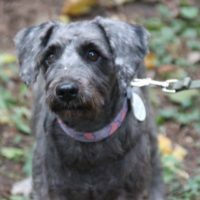 Olivia was found matted and malnourished, but now has thrived to be a beautiful lady. She looks very much like a schnauzer, but is probably a mix. As with terrier traits, she does chase anything that moves, but is good with cats. She has been off leash, but does tend to like going off into the woods looking for something interesting. I have found that she does not like bathroom breaks in her outdoor pen and needs to be taken out for her necessary pees and poos, so she is housetrained. She is now ready for her own chance to a wonderful life. She is super affectionate and loves attention. She is good with children, as she did come from a family with children. For more info, please email her foster mom Virginia at vday@cogeco.ca and fill out an application from this site!